November 29, 2017 – A NASA-led team has found evidence that the oversized exoplanet WASP-18b is wrapped in a smothering stratosphere loaded with carbon monoxide and devoid of water. The findings come from a new analysis of observations made by the Hubble and Spitzer space telescopes. The formation of a stratosphere layer in a planet’s atmosphere is attributed to “sunscreen”-like molecules, which absorb ultraviolet (UV) and visible radiation coming from the star and then release that energy as heat. 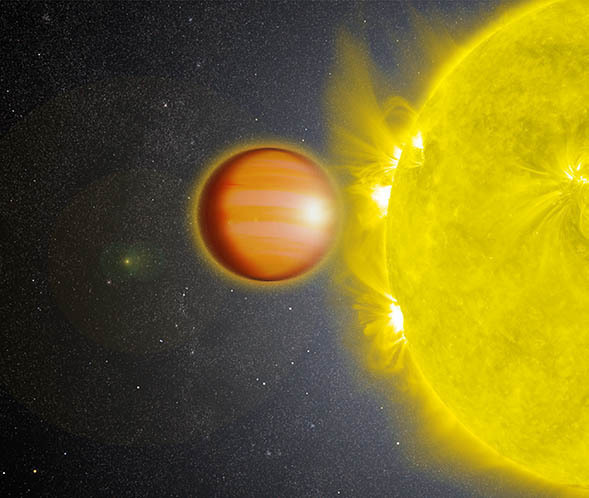 The new study suggests that the “hot Jupiter” WASP-18b, a massive planet that orbits very close to its host star, has an unusual composition, and the formation of this world might have been quite different from that of Jupiter and gas giants in other planetary systems. NASA’s Jet Propulsion Laboratory, Pasadena, California, manages the Spitzer Space Telescope mission for NASA’s Science Mission Directorate, Washington. Science operations are conducted at the Spitzer Science Center at the California Institute of Technology in Pasadena. Spacecraft operations are based at Lockheed Martin Space Systems Company, Littleton, Colorado. Data are archived at the Infrared Science Archive, housed at the IPAC at Caltech. Caltech manages JPL for NASA.